Tool Boxes, Tool Bags, Chests. 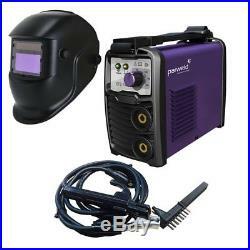 Parweld XTS142 Inverter Arc Welder 230v with Leads & Light Reactive Helmet. Parweld XTS142 140A &###xA0;Inverter MMA Plant &##xA0. With Large Screen auto react welding helmet! A smart, modern, Tiny, portable, compact and yet &###xA0;powerful inverter stick welder for use at home, on the farm in the workshop or on site. Uses: For welding fencing, Agricultural, home fabrication etc. Taking On site, around the yard etc. Material: For welding steel with electrodes up to 3.2mm (Easily)&##xA0. INVERTER TECHNOLOGY, &###xA0;it's so small! Yet so powerfull, machine measures 29cm x 18cm x 22cm yet it can weld 3.2mm electrodes!! It only weighs 4.5kg! Chipping hammer / wire brush for slag removal. Also Large screen light reactive welding helmet! TIG, a tig torch can be fitted to this machine if you wish to TIG weld in the future (Not supplied)&##xA0. Is it ready to use? Yes, but you will need the following: a mains plug wiring on to machine, some electrodes. This is our favourite, it's super small, packs a punch and has reliability. Unlike cheap tin boxes, this compact machine gets the job done without tripping out, overheating etc. All this and it would fit under the seat in your van. Can it be powered by a generator? &###x2022; Supplied with electrode holder, 2m cable, 2m earth lead and wire brush. &###x2022;Over voltage and over current protection. &###x2022; Supplied with a carry strap. &###x2022; Built in electrode anti sticking. &###x2022; Ideal for use with rutile electrodes. &###x2022; Manufactured to IP23S, ISO/IEC 60974-1, ISO/IEC 60974-6 and RoHS Compliant. OUTPUT CURRENT &###xA0; &###xA0; &###xA0; &###xA0; &###xA0;20-140A. INPUT VOLTAGE &###xA0; &###xA0; &###xA0; &###xA0; &###xA0; &###xA0; &###xA0;230V 1P. MAXIMUM ELECTRODE SIZE &###xA0; &###xA0; &###xA0;&###xA0;3.2mm. KVA &###xA0; &###xA0; &###xA0;3. CABLE CONNECTION &###xA0; &###xA0;&###xA0;10-25 Dix. NO LOAD VOLTAGE &###xA0; &###xA0; &###xA0; &###xA0;60V. ENCLOSURE PROTECTION &###xA0; &###xA0; &###xA0; &###xA0; &###xA0; &###xA0;IP23S. WEIGHT (KG) &###xA0; &###xA0;4.5. DIMENSIONS (MM) &###xA0; &###xA0; &###xA0; &###xA0;290 x 185 x 220. R&C Direct is the online sales division of well esablished R & C Components Ltd who have been trading in Hull for over 25 years supplying the engineering and Marine trade along the Docks and surrounding areas. We look to give a nationwide service with a local business mentality. Helping anyone out where we can. We are now specailising in Tool Boxes, Hand Tools, Power tools, janitorial products, paper disposables (centrefeed rolls, toilet rolls etc), abrasives, fixings & fastners, Safety Footwear, High Visibilty work wear and PPE such as safety Glasses, dust masks, hard hats and bump caps etc. We also have a full range of spill protection products available such as full response kits to individual boxes of oil/chemical spill pads and absorbent booms (sausages). We carry large stocks and anything we don't carry is usually available on a next day basis. We like to think there is nothing we can't supply. If you need it we'll get it! PLEASE READ ALL BELOW TO SAVE DELAY IN ITEMS BEING DISPATCHED. IF YOU ARE IN THE SCOTTISH HIGHLANDS PLEASE SEE BELOW IF YOUR POST CODE IS CLASSED AS HIGHLANDS OR A REMOTE AREA! SURCHARGES WILL APPLY TO THE FOLLOWING ISLES AND POST CODES AB30-38, AB44-56, FK17-99, G83, IV1-28, IV30-39, IV52-54, PH31-41, PH49-50, HS1-9, IV40-51, KA27-28, KW15-17, PA20, PA41-49, PA60-78, PH42-44, ZE1-3 ALSO OFFSHORE ISLES: SHETLAND ISLES, ISLE OF MAN, WESTERN ISLES, SCILLY ISLES, CHANNEL ISLES OR ANOTHER NOT ATTACHED TO MAINLAND UK. NORTHERN ISLAND BT POST CODES WILL ALSO CARRY A SURCHARGE. These deliveries can not give a specific date or time this is due to the couriers way of operating. All our Goods are Brand New and not used unless otherwise stated. This listing is currently undergoing maintenance, we apologise for any inconvenience caused. The item "Parweld XTS142 Inverter Arc Welder 230v with Leads & Light Reactive Helmet" is in sale since Wednesday, February 7, 2018. This item is in the category "Business, Office & Industrial\Metalworking/Milling/Welding\Welding & Soldering\Welding\Welders, Cutters & Torches\TIG Welders". The seller is "rc_components" and is located in Hull. This item can be shipped to United Kingdom.